You're witnessing history here, my friends. That's WASHI TAPE! Yes, I own one roll and it seemed like this challenge was the perfect opportunity to pull it out. If you know me well, you know that I'm generally late to most trend parties and sometimes I don't arrive at all! I used Doodlebug Washi Tape, The Cat's Pajamas snowflake die and lots of Stickles. I hope you'll have time to join in all the fun and play along! The deadline is Monday morning at 8:00 am EST, when voting will begin. But even if you don't make a card, you can still vote for your favourite 3 cards. Hope to see you there! This is just gorgeous. The washi tape provides such a fun burst of color. Oh How SMASHING! Love your signature rainbow. I tried last night to stencil and mask an "Ardyth style" rainbow within a Seattle skyline and wow, that was major disaster...I will not give up tho, LOL! My Muse was not as creative, I did a complete dupe, tho can't blame me, I LOVE my NEW PTI Ampersand set! Simply stunning Ardyth. I don't own any washi tape either, but I can see why you succumbed to this one . Oh my goodness...this is absolutely amazing Ardyth! Ardyth, how do you manage to create stunner after stunner? This card is so gorgeous! I might have to CASE this! This is so perfect, Ardyth! Pinning to CASE!!! ...here I thought that I was the only one that seemed to miss these parties! My washi tape collection (pkg of 3 rolls) is used for sticking stuff on the wall! Beautiful card! I love the dimension you have created - especially with the split panel and the pretty tape peeking through! One roll of washi? That's just not right Ardyth! Well if you only have one...you picked a good one! 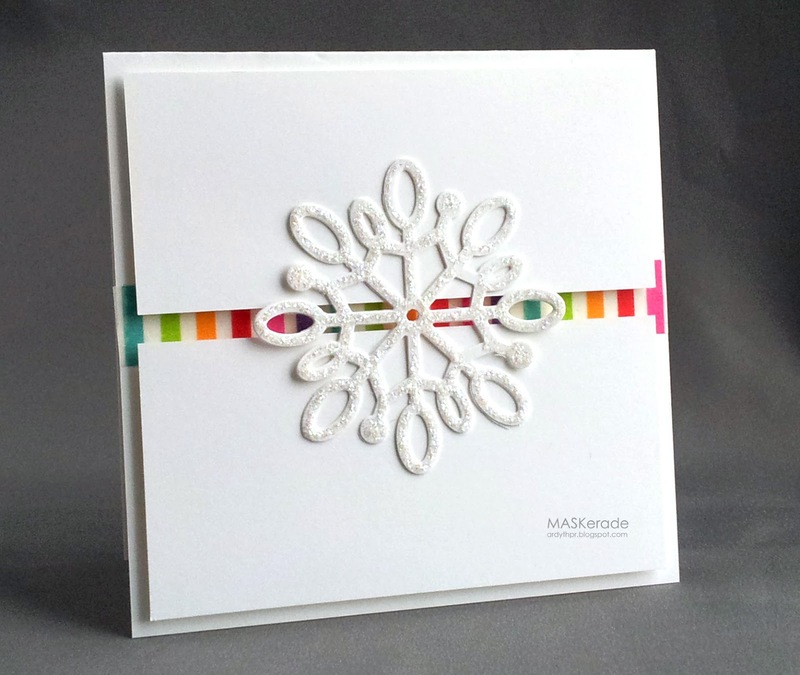 Love this rainbow strip behind the snowflake! Love the rainbow stripe in the background! What a great way to use your only roll of washi tape, Ardyth! I love your snowflake, too! Ardyth buy more, this is exactly how to creatively rock washi!! Oh my gosh! I love your cards, i look often but don't comment much...how often can you tell some one their work is just breathtaking. At some point it must read stalkerish...lol. However, this has to be my most favorite of your cards in the last year! Wow. That washi tape is so you Ardyth! Yet another lovely card. I agree with Cat's remark above, how do I keep commenting and saying Gosh without seeming a bit creepy?? You create such wonderful masterpieces so often, what a talented lady you are. Rainbow washi - just made for you! And you made the perfect card with it. Well, if you're only going to have one roll of washi, of course it needs to be rainbow, right?! I only have one roll, too. Mine's plaid. I've used it once. Really should get that out again! This is so cute. Love all the white. I love your washi tape card and without sentiment, Ardyth. There was one or two cards where I thought in not adding a sentiment, but then I felt like I was cheating (really don't know why... how can I expect others to understand me if I can't understand myself? :) and added one. Whaaat?! You + washi? You totally rock it, in your trademark Ardyth way. Stunning as always, Ardyth. Your designs are just amazing!